When you have discovered the joy of being one with nature the call to return to the wilderness if often heard. I may not have time to put together week long outings, but a few days away sure does recharge the battery. On labor day I shared a great Oregon coast hike from Arch Cape to Cape Falcon in the Oswald West State Park just south of Cannon Beach. 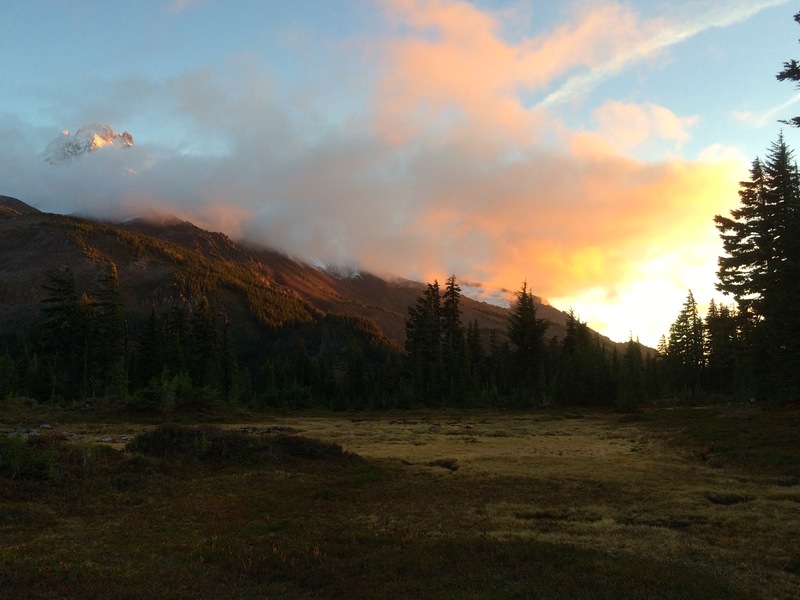 The last 2 days, September 18-19, 2015, I visited the Mt Jefferson Wilderness Area for a night next to a mountain. The weather in Oregon is beginning to feel like Autumn is just around the corner, so a beautiful weekend of heat and sun called for a jaunt up to Mt. Jefferson. 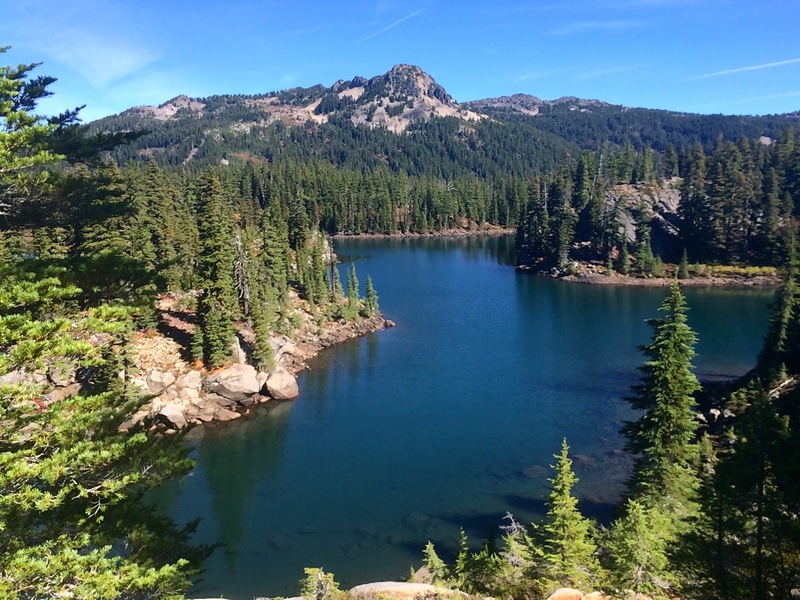 This area of the Cascades is extremely popular which will dictate a reservation only option starting next year for campsites near the many lakes. So with the motivation of choosing the best campsite available I took advantage of the beautiful weather and an early Friday start to backpack into Jefferson Park. The area had received a lot of rain which turned out to be an added bonus as the moisture seemed to spark life into the mostly brown vegetation, not to mention clearing the air for spectacular views of Mt. Jefferson. It appeared that all of the little ponds and wetland area was filled up with the recent rain and thanks to the warm sunny day which heated up the ponds offering me an enjoyable spot to soak my feet. I parked at the Whitewater Trailhead for the 6 mile and 2100 vertical hike which was just perfect for my old body which was in ready for the exercise. I think I may need to do a trip like this at least every few weeks to keep that healthy feeling. 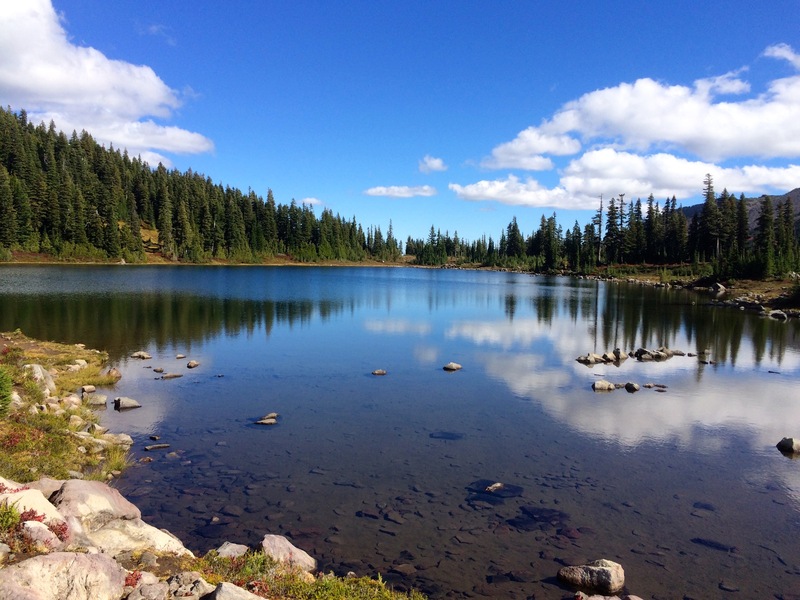 I ended up camping at the east end of Russell Lake which offered some privacy and an excellent view of Jefferson. Since I was essentially at the furthest campsite in the Jefferson Park area I had to respond to a number of groups who came all that way only to realize that all the campsites were taken. The sun dropped quickly as did the temperatures but with it came some intriguing sunset cloud formations around Mt. Jefferson. Of course I took about a hundred photos to end up selecting this one of the sunset with the half exposed mountain. 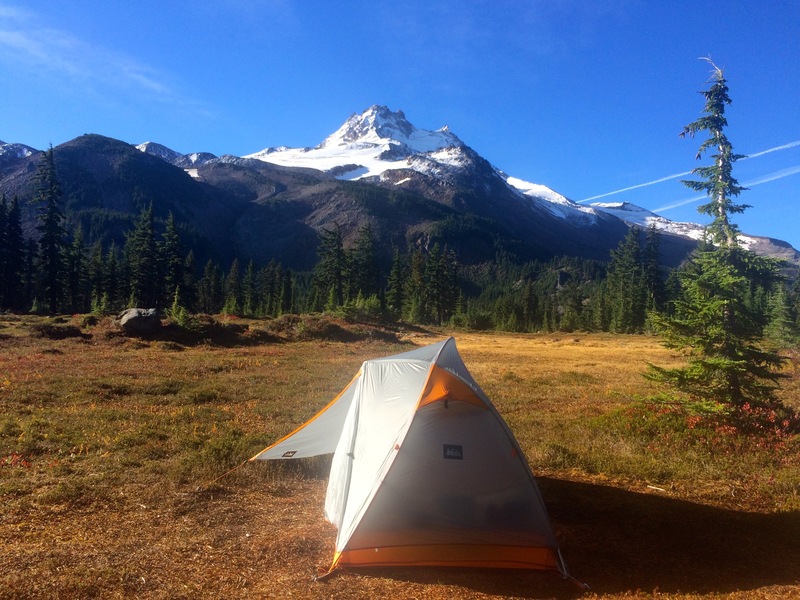 When conditions are optimal one should always consider sleeping next to a mountain. It was a cold night though, had to totally zip up the mummy sleeping bag. The humid air made for heavy dew but the early rays of sun quickly warmed everything up and dried out the tent. The return to the car made for an easy mostly downhill hike in which I took the opportunity to checkout all of the lakes in the Jefferson Park area. I figured if I was going to have to make a reservation for a campsite I wanted to know what they all looked like. The final shot of Mt. Jefferson was as good as it gets. 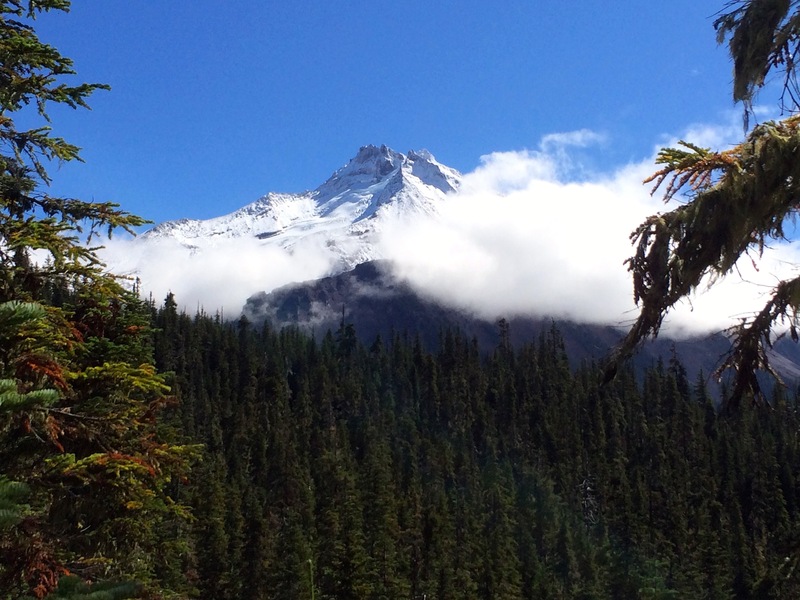 Posted on September 20, 2015, in Backpacking and tagged Jefferson Park, Mt Jefferson, Oregon Cascades, Russell Lake. Bookmark the permalink. 2 Comments. Great photos Greg! My fave is the one with the feet. 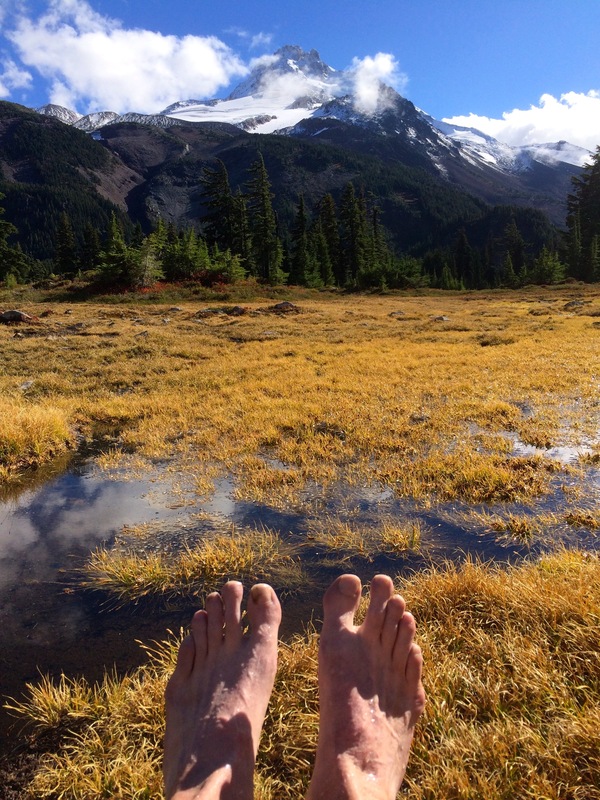 You must pamper those feet as much as possible, when they carry you uphill to places like this. It’s nice to see Jefferson Park earlier in the season. I have only camped there once, and it was in several feet of snow. I hope you found the perfect campsite. I’m glad that you shared this news about reservations, too, since it will help me plan a future trip someday.